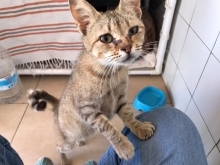 If you would like to donate directly via either of Twinkle's bank accounts then the details can be found at the bottom of this page, please let us know by sending us an email. Ryan Christie is once again taking on the challenge of the Virgin London marathon, Ryan has competed in this marathon twice before with great success and after we had no responce to our offer of a place in this years marathon to other runners, Ryan thankfully agreed to compete again. We are very grateful for Ryan to take on this challenge as it raises much needed funds and awareness of Twinkle. Please support Ryan in what may be the last marathon we gain a place in for a while. 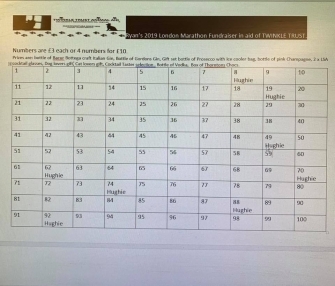 Gill Christie is running a raffle to help promote Her husbands upcoming run as shown in the post above. 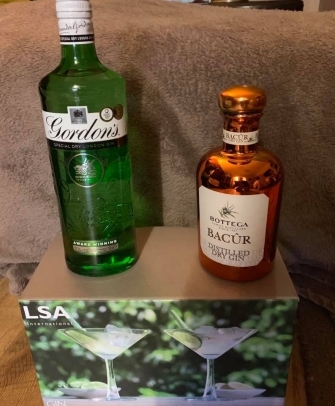 There are some lovely prizes up for grabs, not all alchohol ! 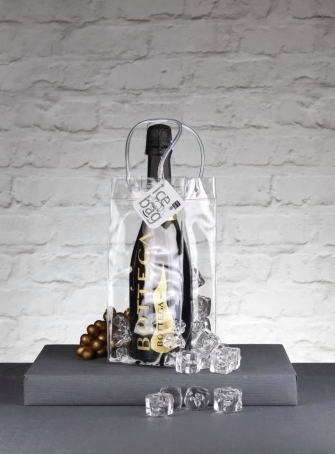 !, there are also chocolates, a gift selection for cats, a selection for dogs and others. 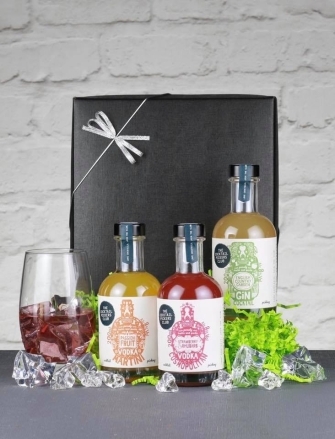 Why not take a chance to win a great prize. numbers are £3 each or 4 for £10. 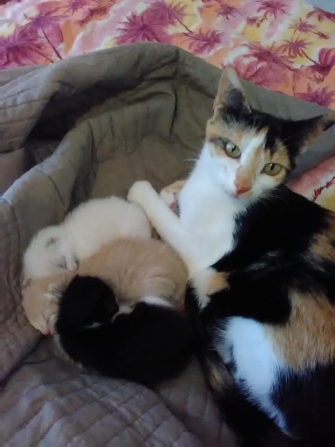 This street mum cat was clever enough to find a kind lady that allowed her into her home where the mum immediately give birth to these 3 very pretty kittens. 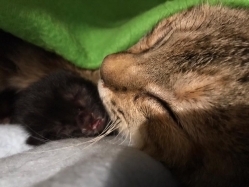 The kittens are just a couple of days old, mum is such a gently soul. You’d think the cardboard box and blanket she’s been given for her and her babies was the best gift ever. 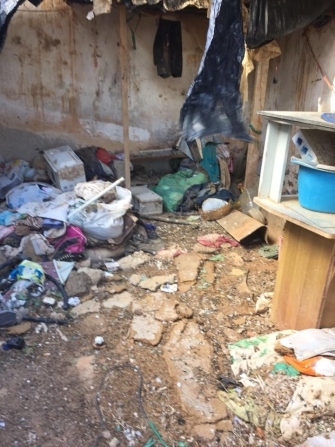 The kind lady that has given refuge to the family can’t keep them, so has asked for our help. 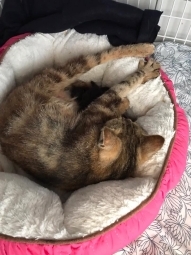 In 8 weeks the kittens will be ready to be homed and so would the gentle mum after she has finished feeding her kittens and been sterilised by us. 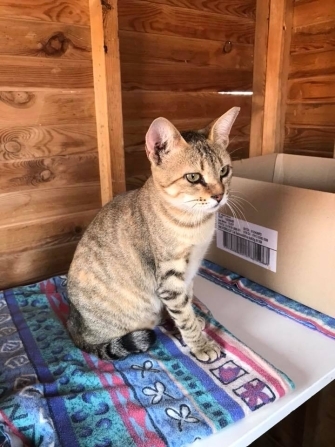 Please contact Twinkle if you can offer a safe, loving home. 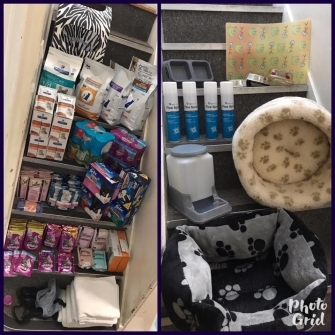 We are very grateful to Claire & Brookmead Veterinary Surgery for the kind donations along with others colleted from kind clients, thank you all and our cat are going to enjoy receiving them. You might want to turn the volume down before you click on this one. 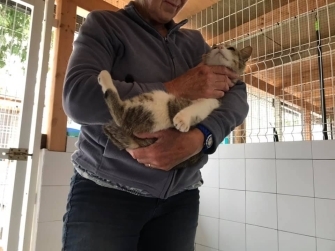 Five very pleased to be released kitties, thanks to a friend of Twinkle who caught 3 females and 2 males that were on our list of cats that urgently needed neutering. 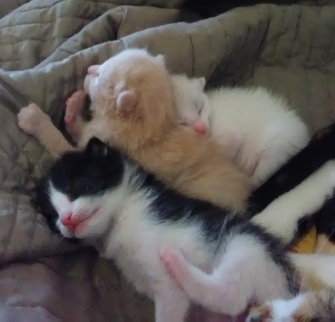 Now they are all done won’t have to go through another year of mating, giving birth to many kittens that couldn’t all survive, and not to mention the fighting for food they all need. Any donations to help us pay the neutering costs would be a big, big help. 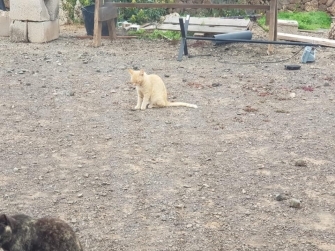 Plus we also want to carry on leaving water and dry food for these cats ( we have been doing this for several weeks to aid trapping them), we’ve been putting down 2 kilos a day. There is no other source of food except rodents and water from swimming pools. One very frightened cat. Last week while trying to trap more cats for neutering we caught this gorgeous cat. He thinks if he buries his head and can’t see us then we can’t see him. 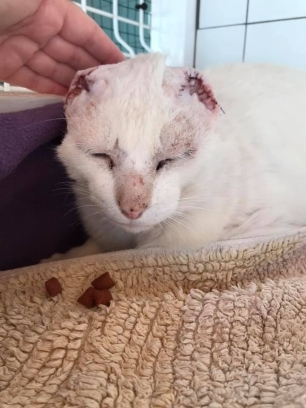 He was already neutered but had skin cancer of the ears. 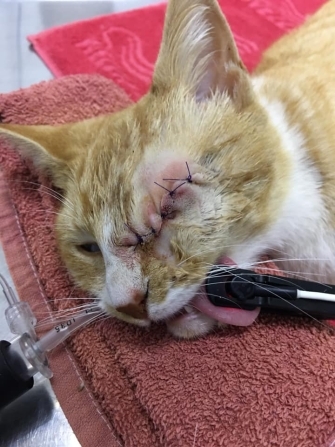 He may also have early skin cancer on his nose and around one eye so it was a difficult decision if to proceed with the amputation of his ears or put him to sleep. 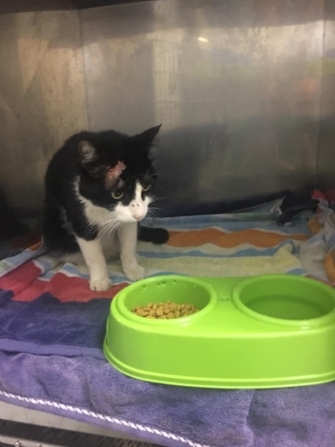 We decided to give him a chance as he’s a good weight so clearly knows where to find his food and we think we can monitor him regularly and step in to help him if more cancer develops. This morning he was up on top of the scratching post and has been letting me give him oral pain medication and now I can stoke him and eventually he stops shaking and starts to relax and enjoy the attention. I think in time he could be a brave and cuddly chap, but unfortunately we cant take in any more cats. 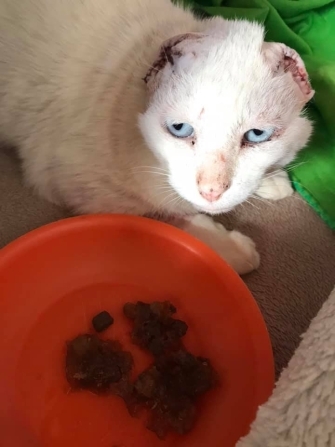 Next week, once we’re sure his ears are healthy and healing ok and no more pain medication is needed he will go back to his area where we can monitor him and pray he has a better chance of a pain free, comfortable life. 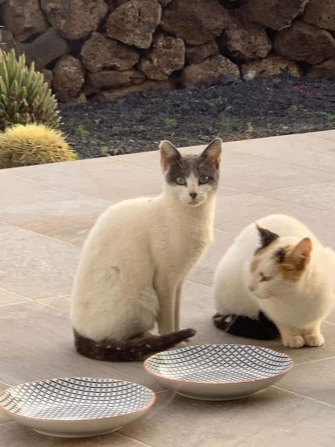 Thanks to our lovely friends Judy and Suza we were able to catch and neuter 2 males and 3 females last week from a little village near Los Estancos’. 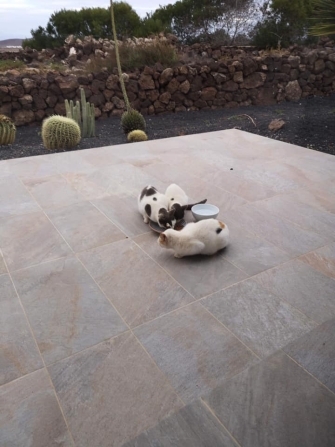 The people that feed them clearly have very little money but share what food they can with this little cat family and they are all sooooo loving. It was magical to see how happy the children were to see the cats come back. Huge thanks to Judy for all her help, couldn’t have done it without her. 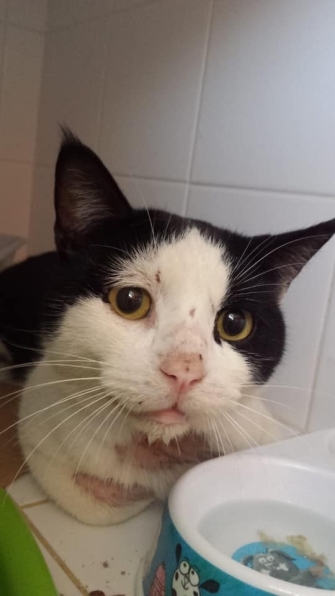 Errol as this cat has been named was found with severe fungus infection under his chin and on his leg, which is why we were called to help, But once he was under anaesthetic the vet noticed he had a large piece of bone, probably chicken, stuck deep under his tongue. which must have been very painful, and which has most likely caused his immune system to weaken as you’d expect, and this could be why his fungus infection is as bad as it is. These were taken by the vet as he operated to remove the large piece of chicken bone. Errol was given the all clear by Antonio of Species vet clinic. 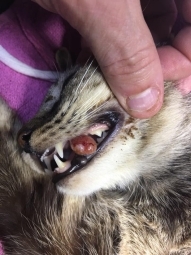 The stitches under his tongue will stay in until they dissolve which will be about 20 days, by then the big hole under his tongue from the large piece of bone would have closed up and he won’t suffer anymore nasty infections. His skin has improved so much that Antonio says he he safe to go back to his spot, where he can be monitored by Judy and Debbie. 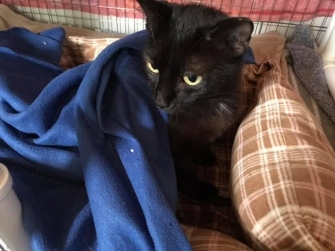 We also had him castrated and treated against fleas and worms so he’s now able to lead a more peaceful life without fighting for females and territory. Our thanks to Judy, Hamid and Debbie for helping us to help Errol. 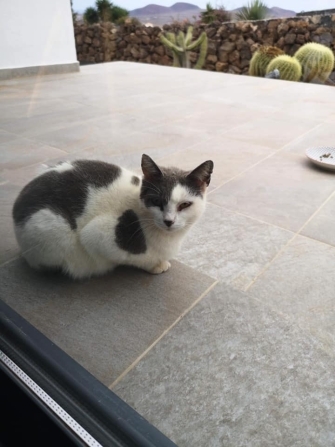 Recently we had a desperate call about a cat that had managed to get himself to the door of 2 compassionate holiday guests in Caleta de Fuste. We believed he had been hit by a car. 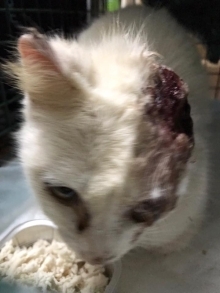 He was unable to walk properly and had several areas on his head and hip of torn skin and was crying out in pain. 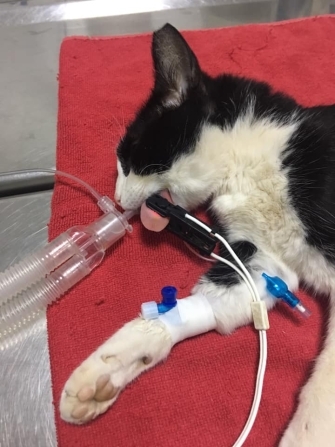 Thankfully Bichos vet’s opened up their clinic and thanks to Judy dashing off into the night to go and get the poor cat, he was having emergency X-rays and treatment within an hour. 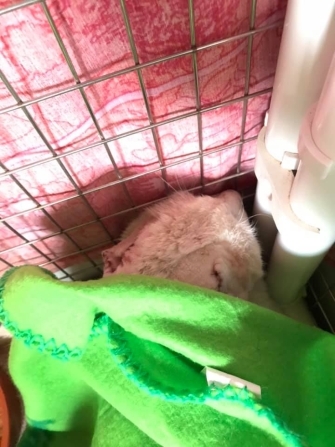 He was made comfortable and given fluids and medication for what appears to be head trauma from bouncing in the road from impact of a car and his hip has come out of its socket. 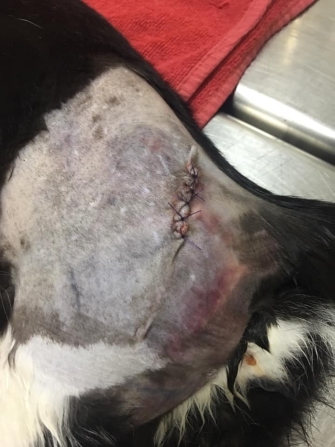 Percy has had his operation on his hip and he’s doing sooooooo well. We had to wait until his urine was blood free and he was stable. He was eating and standing on his leg just hours after surgery. 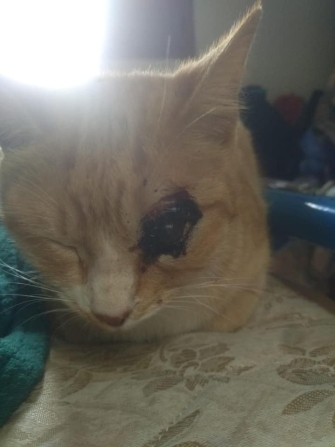 Thankfully there is no permanent damage to his head or brain from where he’d bounced onto the road and the head wounds will heal fine, considering he’s about 6 years old he’s just amazing, just like a kitten, so loving. 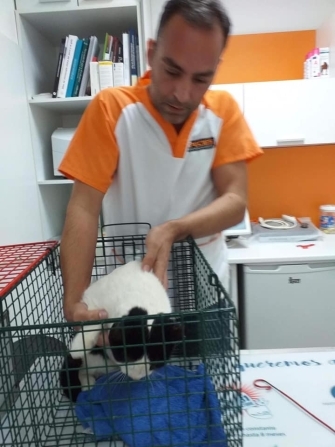 Thank you so much Javier of Bichos for giving Percy one of his 9 lives back.More updates soon. 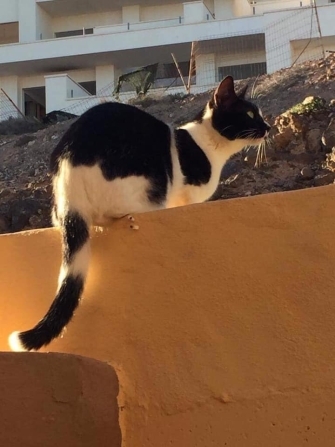 We have been contacted to help a stray colony of up to 8 cats living around some holiday villas located towards the north of the island. 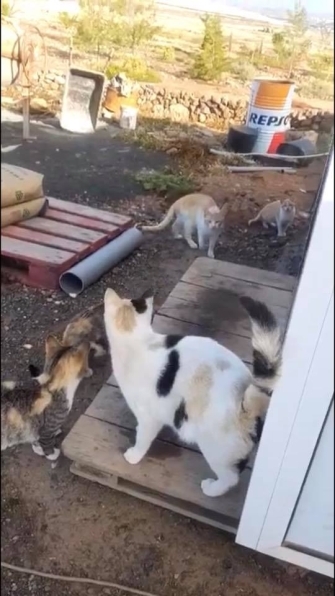 Originally we were told there were only 5 cats but many more appeared. 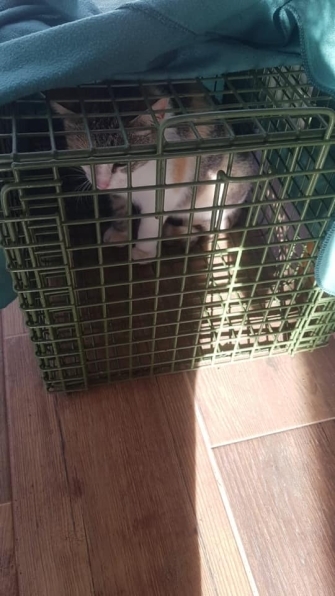 Thanks to a wonderful Twinkle friend who is going to trap and transport them to the vets and look after them while they recover, our plan is to catch them in the next couple of days and have them all neutered to prevent more unwanted kittens being born. Firstly thank you to all our supporters for donating towards Calina’s big operation. 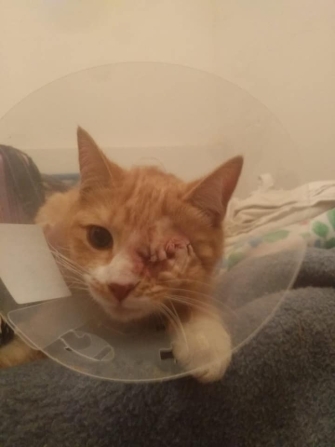 As suspected her eye did have to be removed but the long surgery went very well. She’s not too keen on wearing the big collar or her daily pain medication but she’s recovering just great. She needs to see the vet next week to check her progress but thanks to the skill of Bichos we think she’s going to recover just great. 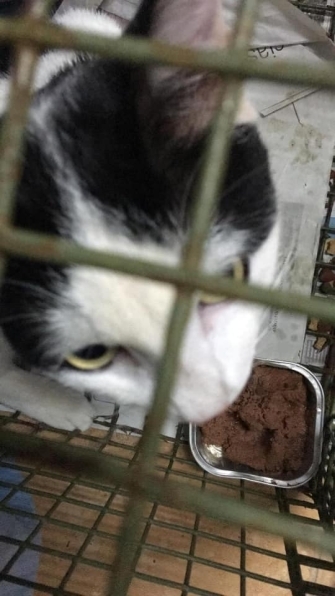 This poor adult female cat was kicked out of her home when the female owner realised her cat was pregnant. Thanks to some kind neighbours that took pity on the mum and her 3 starving kittens they now get feed each day. Twinkle were asked to help get them all neutered before they all began mating. I’m so pleased to be able to say all 4 girls (mum and her 3 kittens) have now been sterilised. 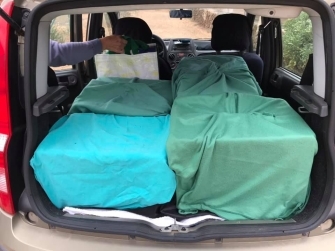 This was a huge team effort by the caring ladies that have taken to looking after them, for trapping, transporting them to our clinic and looking after them so well while they recovered and to Judy for running around making sure everyone had our cages and helping me get everything organised. What can we say but THANK YOU EVERYONE. On Monday with the help of two very strong men we went and dismantled the shed, then transported it to where it needed to go and then not only put it back together but reinforced it and modified it so there is now a cat flap, a shelf inside and the glass windows were removed and fitted with mesh and galvanised metal to ensure its escape proof but well ventilated. 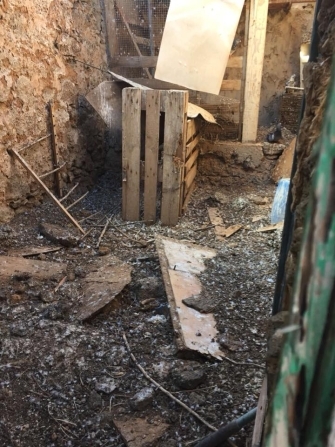 It took from 9am until 7.30pm from start to finish to complete the “mission” on Monday and the guys worked really hard and the results are fantastic . 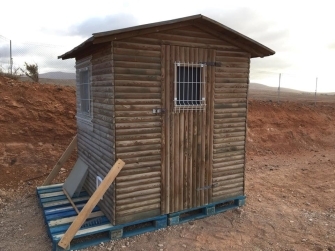 The shed was very kindly donated by Julie Elliott and is pur-fect to house the lucky five cats as they adjust to their new surroundings. 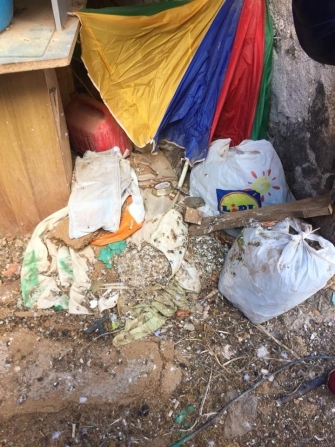 In all it only cost twinkle €120 including materials, labour and petrol, so we have a bit left from your donations. This money will be put towards the vet bill at Bichos vet clinic. 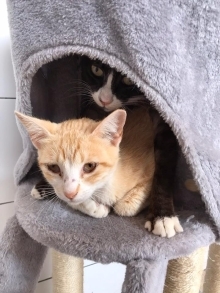 On Tuesday we took Willow, Harry, Toffee, Milly & Caramela to their new home and their new mum is settling them in & now finally they can begin their new happy ever after. Is this really a house?, a home?, you might ask ! Yes it really is for 1 poor unwell man and his many cats. We were asked to help some cats 2 months ago in a non tourist area. Directions were very vague but we went, unfortunately we couldn’t find the “house” or the cats we were told of. 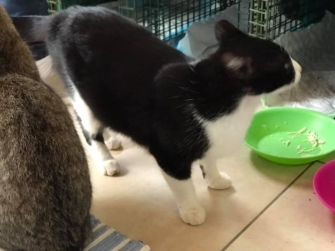 Unable to get any more information we had to give up.... but the story of 20 starving, unneutered cats kept playing on our mind. 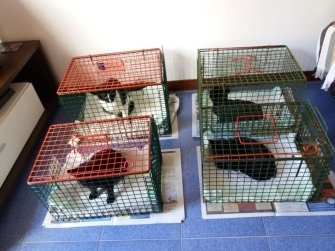 When friends/volunteers Catherine and Suza offered to help catch some cats for neutering last week, I gave them them what little details I had. With Catherine’s “never give up attitude” and Suza’s brilliant help & local knowledge, plus long phone calls in Spanish in the dark whilst bouncing down dirt tracks to nowhere, they saw an old ruin way off in the distance close to an unused beach, far from civilisation, electricity, water and any sign of life. By now it was almost dark as they reached the run down house. Still on the phone to the person that originally told us about the situation, they were told to call out to the occupant, out of the darkness a frail man appeared and after explaining we were asked to help his cats he let us inside.I say inside but there is no roof to speak of just torn and weathered tarpaulin and a front wall with a padlocked door. 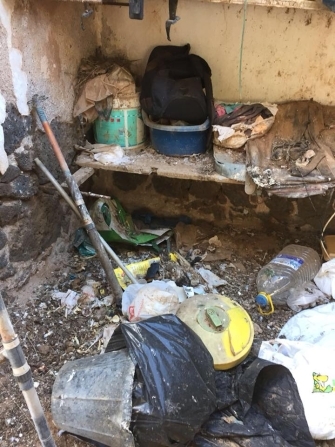 Inside were 9 live cats, 2 live kittens with inches of bird droppings covering the floor and everything else and rubbish everywhere, they found dead kittens and other decomposed matter that could not be identified. By now it was completely dark, stepping anywhere or moving things out of the way to search was lethal. But by 1.30am they had caught all but 2 of the cats, 1 being a mum with crying kittens in a difficult get to corner and a clever ginger that took off. 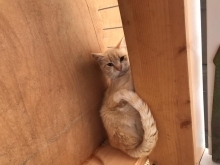 After a brief pause and stepping outside to catch their breath they went back in ( having to use their phones as touches) and managed to trap the mother and then went diving into goodness only knows what, to reach in and get the 2 live kittens. With the ginger cat nowhere to be seen, they promised the man they would return the next day during day light, to try and catch the last ginger cat. 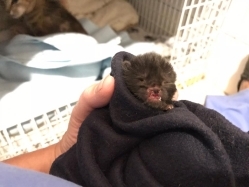 These are the photos of the cats and kittens we rescued from the ruined house. 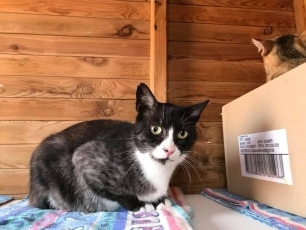 8 adults are still with Twinkle until we can find new homes. 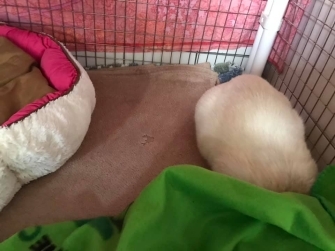 Although they all had to be trapped,all but one is very sweet and friendly, they just weren’t used to seeing anyone other than their poor dad. 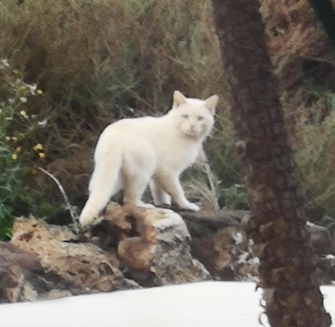 Unfortunately the white cat had a huge internal head tumour, she was so friendly but any bright light caused her pain so we made sure her last night was clean and cosy, she could only eat liquid food so we mixed up some pain medication into Mercadona liquid cat food with mashed up chicken, which she loved, I think she had the best nights sleep in a long time. 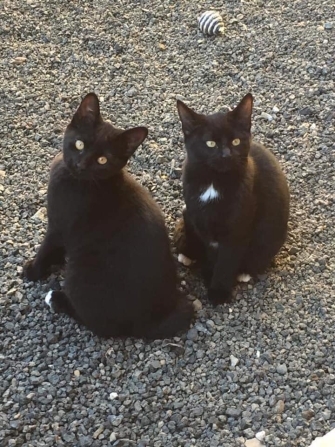 Two of the females had obviously had kittens recently but because the kittens had not survived they had developed mastitis we’ve got them on medication and already they are looking and feeling more comfortable and in less pain. 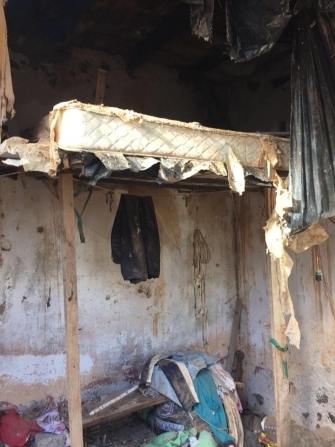 The friend of the sick owner that initially asked us for help is trying to convince the man to accept professional personal help from the church and local authorities so he can be moved to a special needs home where he can receive professional medical and mental health treatment. He is a good man at heart, that just can’t care for the cats or his frail self. Please let us know if you donate into either bank account so we can thank you.